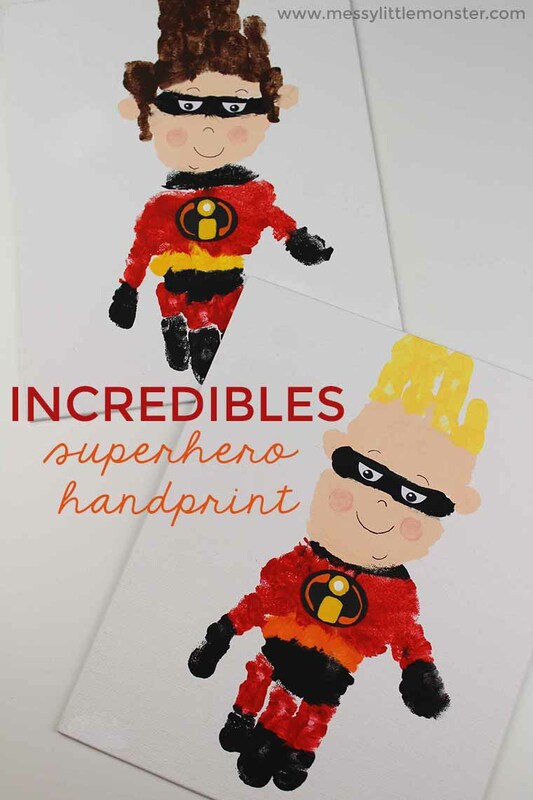 If you're looking for a fun superhero activity, you'll love this superhero handprint craft for the incredibles 2 movie! Your toddlers and preschoolers will love these superhero handprints and will love being a part of the process. 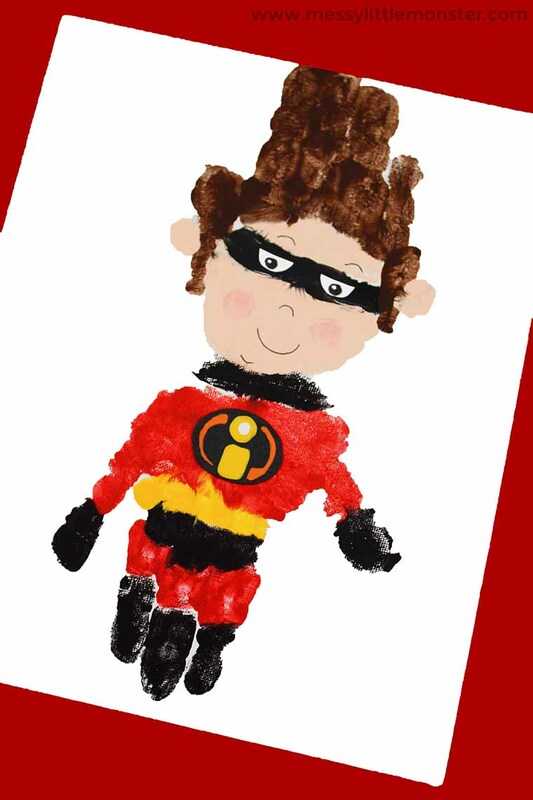 Just follow the easy step by step directions below to make your very own the incredibles 2 superhero handprint craft! 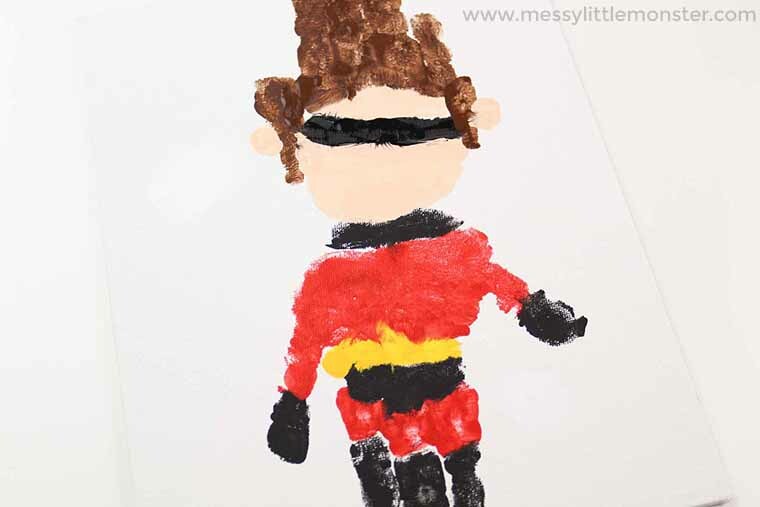 Are you looking for more superhero handprint craft ideas? Check out our batman handprint, hulk handprint, spiderman handprint, or even our teenage mutant ninja turtles handprint! I totally love all our superhero handprint art! 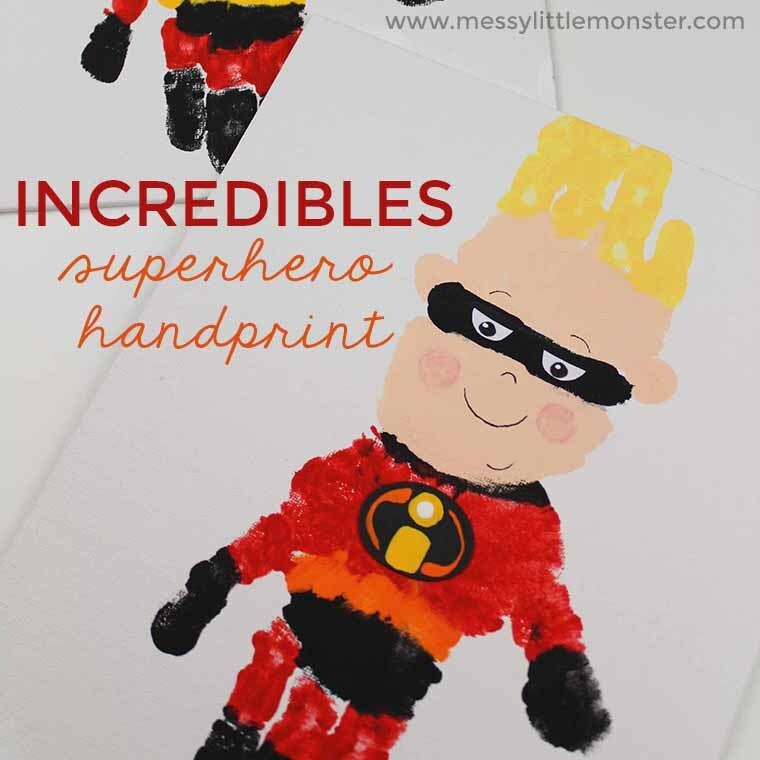 Below you will find easy step by step directions to walk you through how to make your own the incredibles 2 superhero handprint craft! If you're looking for even more fun, turn your superhero handprint craft into coasters or make your very own superhero puppets! 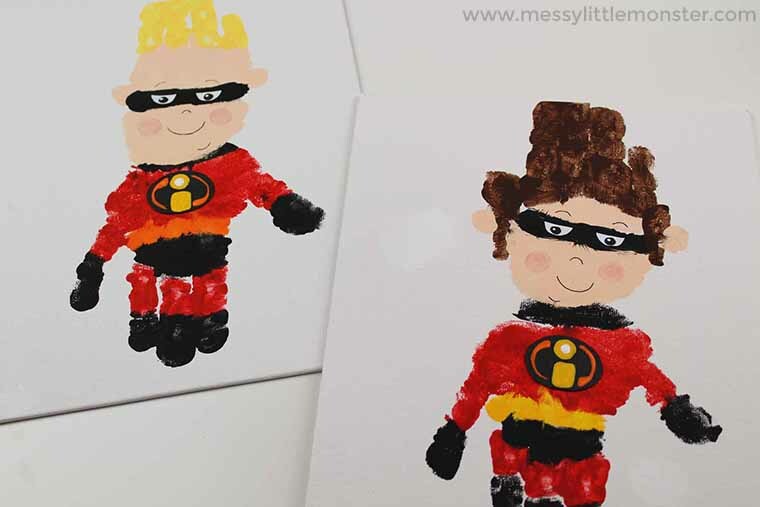 This set of superhero handprint instructions shows you how to make a set of 2 incredibles handprint crafts. You may want to make one superhero at a time or do it in steps as suggested below. Before we get started, make sure to round up all your supplies for this superhero handprint craft. It makes it so much easier when you're not stopping to go look for something - especially with toddlers and preschoolers that have trouble sitting still! To make things even easier, I would suggest pouring out your paint colours into a paint tray or onto a paper plate. 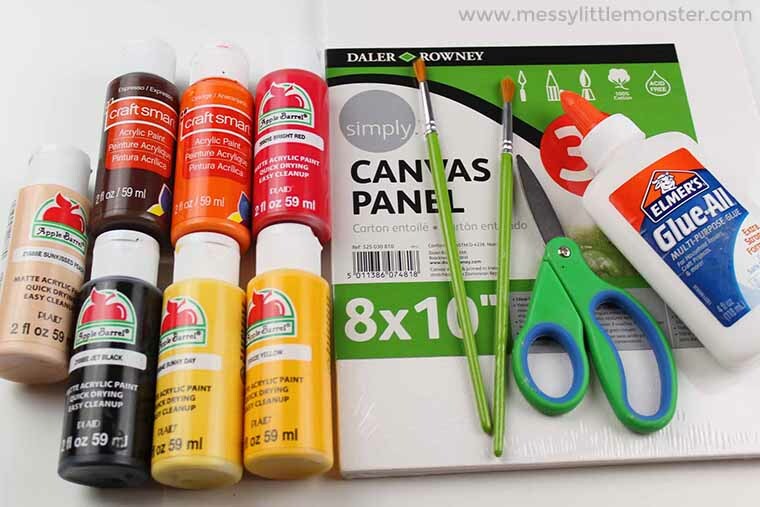 Now that you have your supplies ready, it's time to get painting! We are going to make two different superheroes handprints. 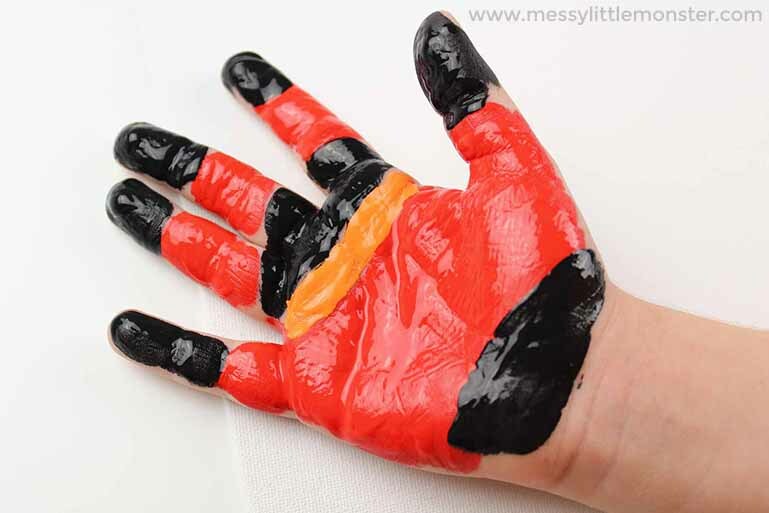 To start, paint your child's palm with red, black, and yellow paint as shown in the picture below, making sure they keep their hand open to avoid smearing any paint. Then, have your child press their hand firmly onto the canvas towards the bottom. You may need to help them to make sure they press hard enough onto the canvas. Help them gently lift their hand off the canvas to avoid smearing the paint. For the second superhero handprint, wash off the paint and then repeat the steps above, replacing the yellow paint with orange paint as shown below. Allow the handprints to dry completely before moving to the next step. 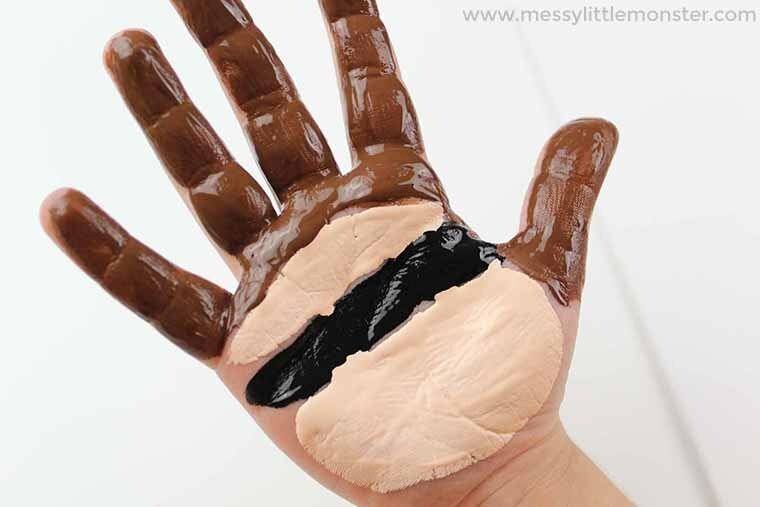 To make the top half of your incredibles handprint craft paint your child's palm with brown, black, and khaki coloured paint as shown in the picture below. Make sure they keep their hand open to avoid smearing paint. Then, turn the canvas around and have your child press their hand firmly onto the canvas gently overlapping the handprint for the bottom half just slightly. 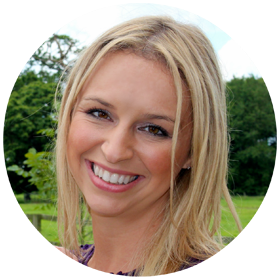 You may need to help them to make sure they put enough pressure onto the canvas. Help them to gently lift their hand off the canvas to avoid smearing paint. 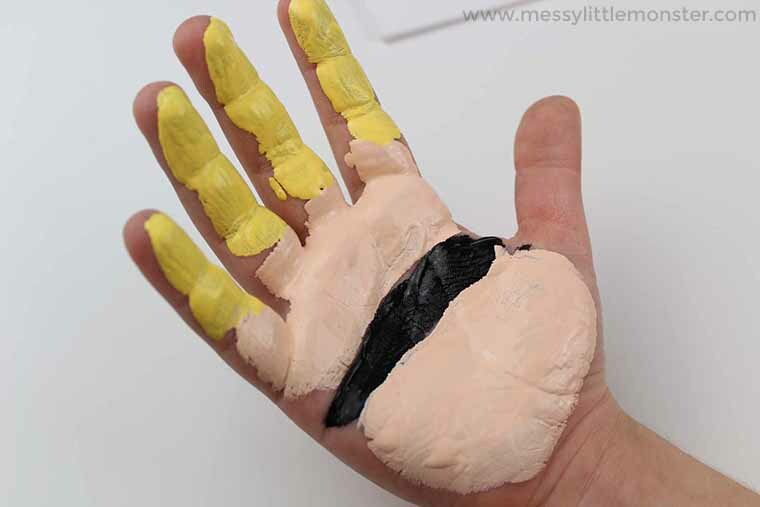 For the next handprint, wash off your child's hand and repeat the steps above, replacing the brown paint with yellow and do not paint the thumb, as shown below. Allow the handprints to dry completely before moving onto the next step. 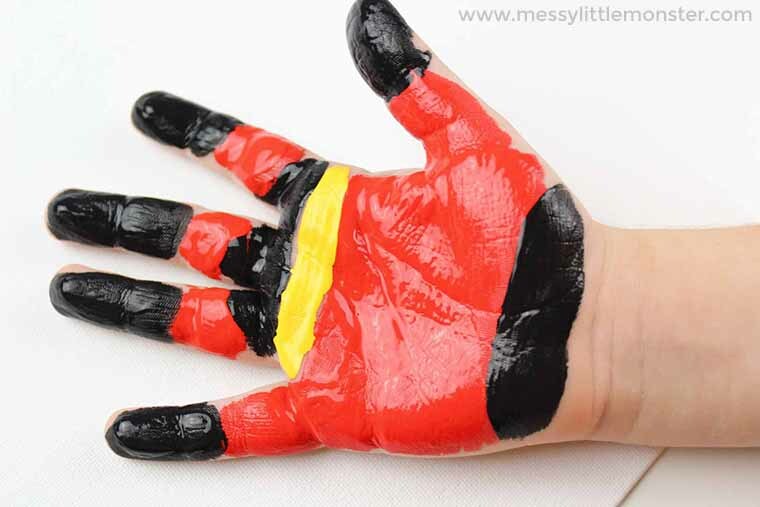 Now to add all the details to your superhero handprint craft! First, cut small half circles from white cardstock and glue them onto the face masks. Dip the end of the paintbrush into black paint and add an eye to the center of the half circle. Allow the paint to dry completely and then repeat with white paint, making the dot much smaller. Help your child dip their finger into pink paint and dab a little on the superhero's cheeks. Use a fine tip black marker to add a mouth, chin, nose, and eyebrows. Cut an oval from black cardstock and glue onto the center of their chest. Paint the incredibles logo onto it as shown in the photo below and allow the paint to dry completely. We hope that you have had fun making this cool superhero handprint craft with your preschoolers and toddlers! 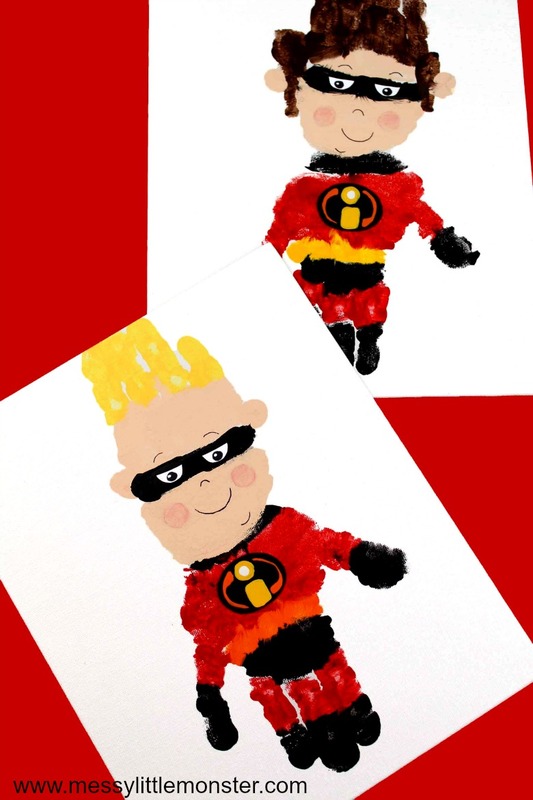 Check out some more of our superhero handprint craft ideas! 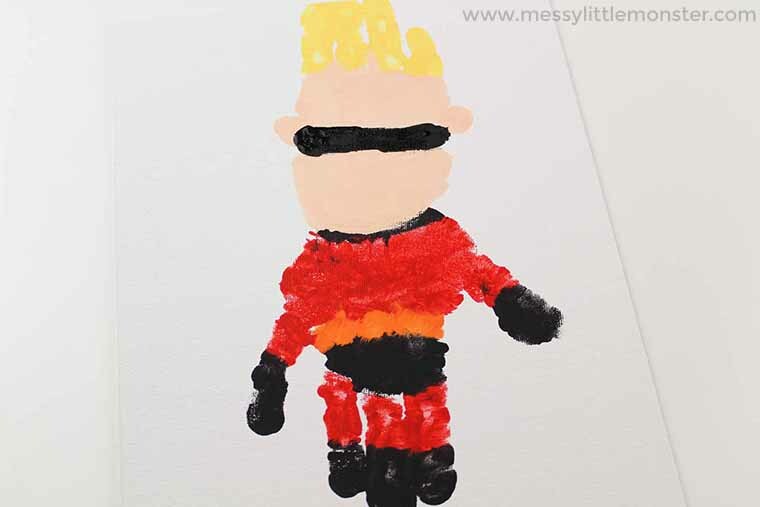 Your toddlers and preschoolers are sure to love this superhero handprint craft! The more you can involve them, the better. 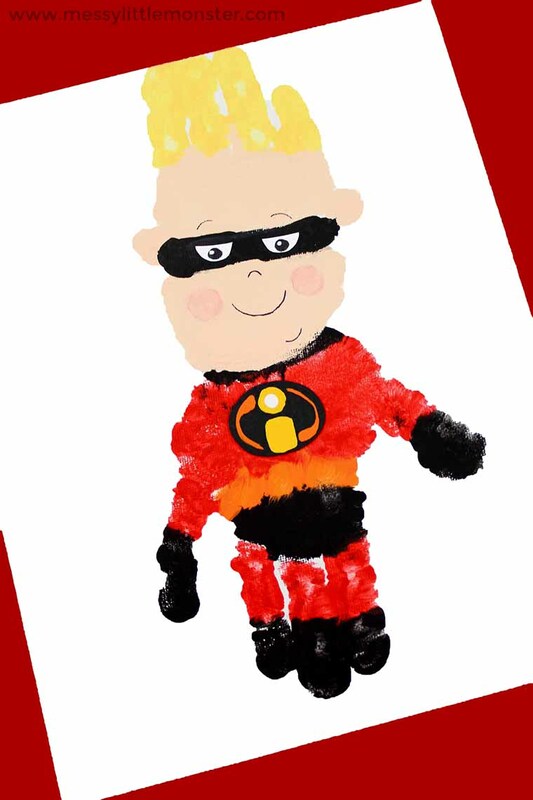 They will feel so proud of this cool superhero activity - especially because it's for the incredibles 2 movie! 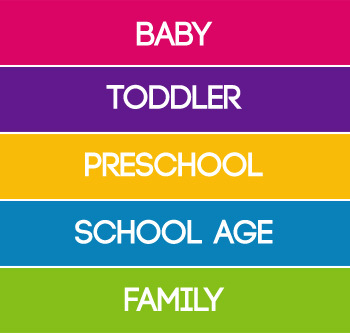 Don't forget to check out all our other superhero activities for kids.